The Grip Force Adapter for Glock pistols provides a slight beavertail to protect your hand and changes the grip angle for those that prefer a 1911 style grip angle. The Grip Force Adapter mounts to the contour of your Glock and permits a better grip and better control. 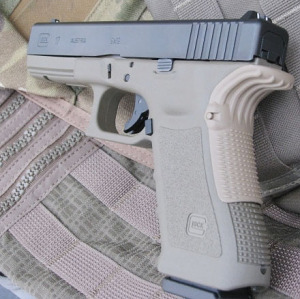 Durable FDE, Flat Dark Earth polymer with required pins included. Fits Glock 17, 19, 22, 23, 24, 31, 32, 34, 35, 37, 38 Gen. 1,2,3 pistols and some Gen 4 depending on configuration. See our Grip Force Adapter Fit Chart for complete information.